I had originally wrote on my calendar that October 15 was World Poetry Day. However, after some research it appears that World Poetry Day was changed to March 21 in 1999 by UNESCO (United Nations Educational Scientific and Cultural Organization). Apparently not everyone got the message, as many still celebrate the holiday on October 15, which commemorates the birthday of Virgil, a classical Roman poet. Ohio Poetry Day is celebrated every third Friday of October which happens to fall this year on October 15. In 1938, the State of Ohio was the first state government in the United States to establish a poetry day. According to Ohio History Central, Tessa Sweazy Webb spent 13 months lobbying the Ohio General Assembly to create Ohio Poetry Day. Her most memorable quote was, "For each living reader a living poet, for each living poet a living reader." This year's 73rd celebration of Ohio Poetry Day will be held at Heidelberg University in Tiffin, Ohio. The reason I mention all this is because I wanted to celebrate a poet's birthday with my children that coordinated with World Poetry Day/Ohio Poetry Day. I decided on E.E. Cummings as the anniversary of his birthday is October 14. 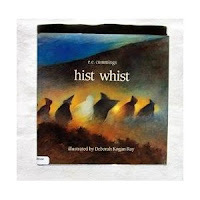 We started off by reading his poem hist whist, which we found in Jack Prelutsky's The 20th Century Children's Poetry Treasury and the picture book Hist Whist , illustrated by Deborah Kogan Ray. (Click here to read the poem at Poetry Foundation). This is great poem if your family likes Halloween. Next we read the poem, little tree. (Click here to read the poem at Poetry Foundation). We read the poem from the picture book Little Tree by Chris Raschka. It was early in the year for a Christmas story but we enjoyed reading the poem and how Raschka developed it into a picture book. Lastly, we read Fairy Tales , illustrated by Meilo So. This book has four fairy tales, actual stories not poems, by Cummings. According to the epilogue, three of the fairy tales were written for Nancy, his daughter at a young age. The fourth fairy tale, The Elephant and the Butterfly, our favorite, was written for his grandson. I enjoyed learning more about E.E. Cummings this week as I can still remember reading his poetry in middle school. He was most known for his unique way of using punctuation and capitalization. Many of his poems had a visual component that was vital to the interpretation of the poem. I did not know that he was also an accomplished artist which helped me have a greater understanding of why his poems had visual presentation. At the time of his death in 1962, Cummings was the second most read poet in the United States after Robert Frost, (poets.org). Whether you are celebrating World Poetry Day, now or in March, Ohio Poetry Day, or E.E. Cummings birthday I would suggest reading the poem a leaf falls which I felt was appropriate for the season. (Click Here to Read at Old Poetry and here it is also at Helium). Thanks for your comment. I am glad you enjoyed the post.